Fermenting sauerkraut is extremely easy, affordable and so much tastier than store bought. It’s the real deal. No extra yucky ingredients that you can’t pronounce like those in store bought kraut. 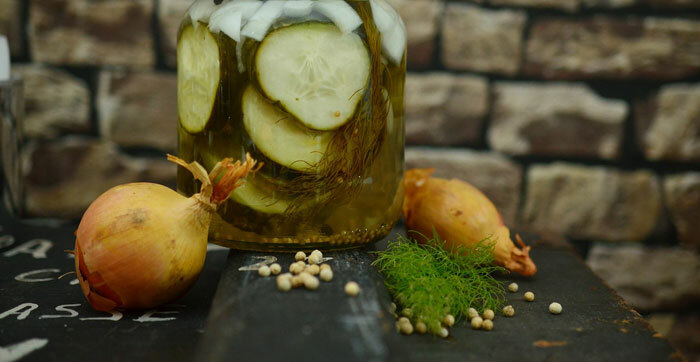 All you need to ferment some good ol’ fashioned sauerkraut is a fermenting jar (or canning jar with fermenting lid or a fermenting crock) and your ingredients. Fermented sauerkraut is cabbage and salt. That’s it! Some recipes use seasonings also, such as caraway seeds. The cabbage creates it’s own brine, when salt is added, to stay submerged under during the fermenting process. There is NO cooking or heating involved. Fermenting prep takes very little time, but the actual fermentation process usually takes 3 to 6 weeks until final product is ready to eat. But the good news is you just let it sit for that time. Do not stir. Fermented foods are also very beneficial to your body and are full of probiotics. 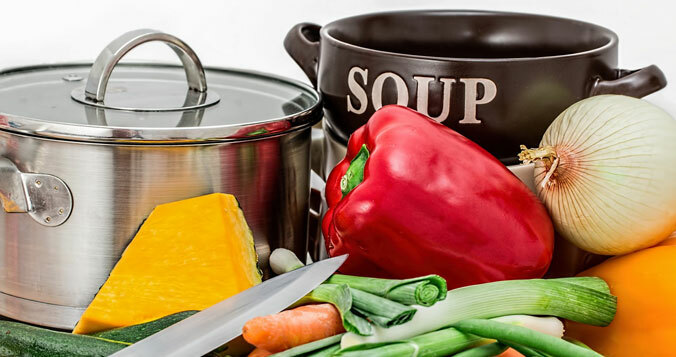 We recommend you do not can the final product as the heat will destroy the good bacteria that fermentation creates. I’ve made regular sauerkraut over and over again. 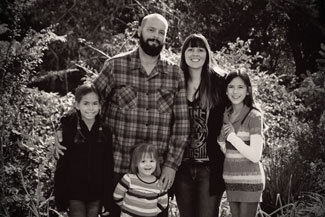 We love it, but I wanted to create something new, especially for my husband who LOVES spicy foods. He adds hot sauce and peppers to everything. EVERYTHING! You probably know someone like that, too. 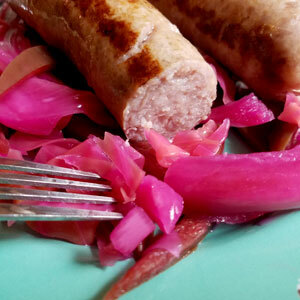 We had a red cabbage we got from one of our local farms and I decided now was a good time to experiment. My Oma used to make sauerkraut with red cabbage for every holiday. So I took a fond memory and my love for my husband and combined them to make our all-time favorite sauerkraut recipe. Prep is easy. Core and thinly slice the cabbage, thinly slice the onions and jalapenos. If you want the sauerkraut to be extra spicy, leave seeds and membranes in the jalapenos. The seeds that fall out from slicing, simply add to fermenting jar and it will make a big difference on the spicy factor. Now we’re going to massage our cabbage with the salt. Why? The salt reacts with the cabbage and causes it to release it’s juices making the best brine you want for your sauerkraut. It also helps soften up the kraut so it packs into the jar better (don’t worry, it won’t end up soggy). 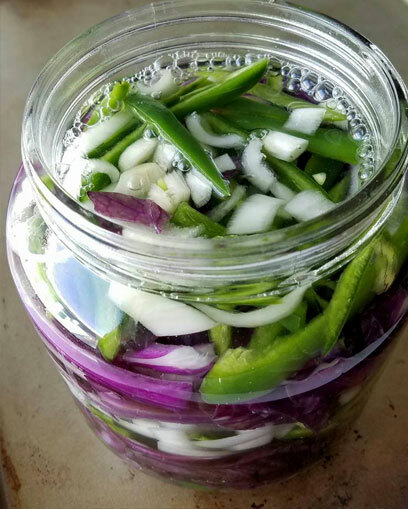 Next, mix the jalapenos, onions and cabbage together and pack it into the jar. 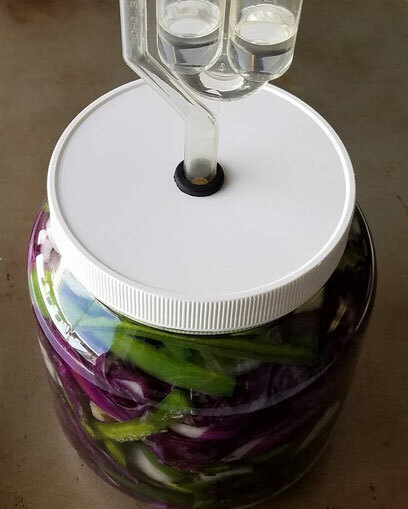 Top off jar with brine created from cabbage. Make sure sauerkraut is completely submerged under brine. If enough brine was not created, add distilled water. Make sure brine will completely cover sauerkraut when weighted down. Weigh the kraut down. This is extremely important. If oxygen hits the kraut, it will get bad bacteria. We don’t want that. We only want the good bacteria. 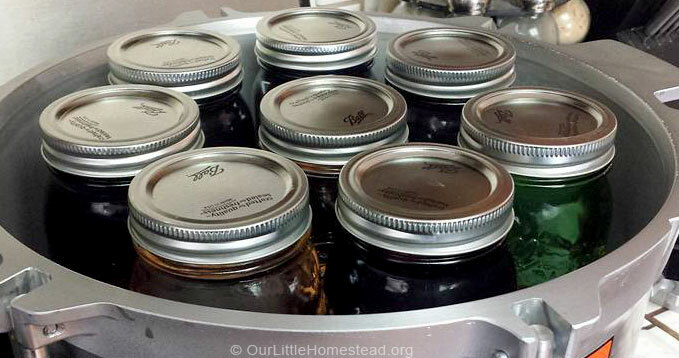 Add your lid and set your jar or crock on something with a lip. There will be gasses escaping and it will cause liquid overflow! Set it in a cool dark place for 3 to 6 weeks. Now just let it sit. You have 3 to 6 weeks to binge watch Netflix before it’s done. Once your sauerkraut is done, transfer it to an airtight container and put in the fridge. It will last for several months. That is, if your family lets it! 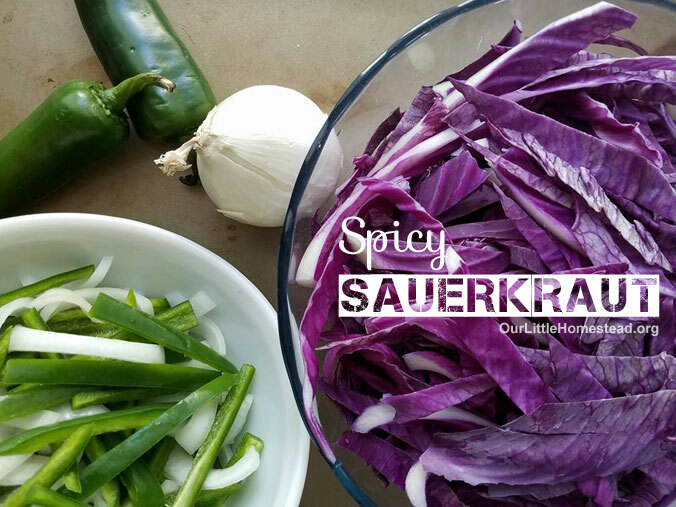 Using the old fashioned way of fermentation, this easy sauerkraut recipe uses hot peppers and red cabbage for a new spin on an old favorite. Wash, core and shred cabbage. Place in a large bowl. 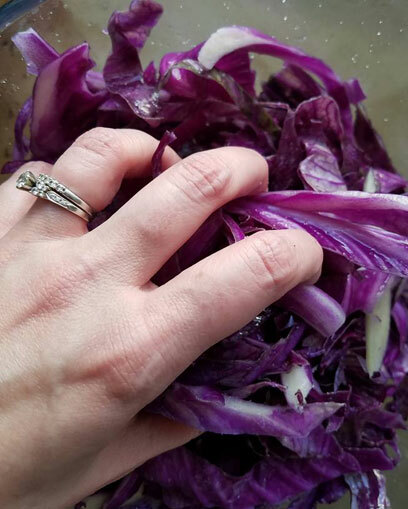 Sprinkle salt on cabbage and use hands to massage it into the shredded cabbage. Let sit for 5 minutes so juices can start to release from cabbage. Thinly slice onion and place in a separate bowl. De-seed (or don't if you want it more spicy) jalapeños, thinly slice and add to bowl with onions. Mix them up a bit. Now that cabbage has sat for 5 minutes, go back and massage and squish the cabbage with your hands. The goal is to release as much juice as possible, as this will be your brine. Leave 5 more minutes and massage again, if needed. Add onions and peppers to cabbage and hand toss. Add it to a 1/2 gallon jar, packing it in as you go. Pour brine from cabbage into jar. If it doesn't completely cover the mixture, top off with a distilled water. Use a weight to keep cabbage completely submerged under brine and add jar lid. Place jar on a plate with a lip (gasses will escape causing liquid overflow. It's normal). Let sit in a cool dark place for 3 to 6 weeks, or until desired taste is reached. Store in an airtight container in fridge for months. Tired of your canned pickles turning out soft and mushy? Try fermenting your cucumbers into crispy pickles! Not only are these easy, but also full of natural probiotics! 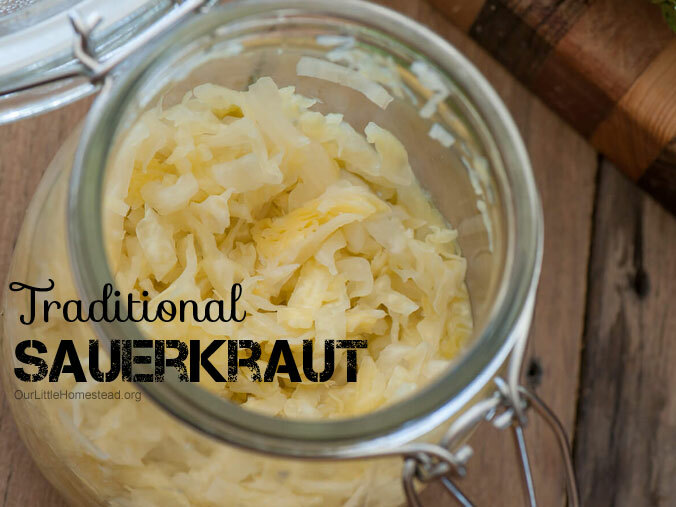 With just 3 ingredients, you can easily make old-fashioned fermented sauerkraut! Full of probiotics and other healthy bacteria. The taste alone will make you never want store-bought kraut again.